Hyaluronic acid has become more and more popular over the years and it’s an important ingredient to look for in your skin care products. What is a Hyaluronic Acid Serum? Hyaluronic acid is naturally found in our skin and keeps it fresh, sustaining the skin cell renewal process. 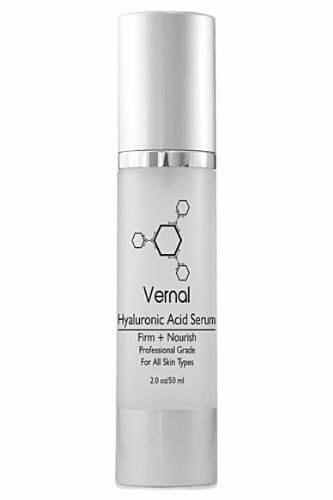 The best thing about the hyaluronic acid is in fact its impressive ability to retain water. One of the signs of the skin aging is the dryness of skin which is caused by the loss of the skin to hold in water. This only translates into less firmness of the skin and the appearance of fine lines. As collagen is mostly made of water, it makes sense that our skin needs more of it for younger appearance. What are its benefits to the skin? When you’re using hyaluronic acid, not only it hydrates plumps your skin, but it also reduces the visibility of fine lines and wrinkles. Hydration isn’t the only good thing related to hyaluronic acid. It’s well known that this substance also has antioxidant abilities that protect your skin from the outer stressors, harsh chemicals and sun exposure. Is it good for everyone? Hyaluronic Acid is safe to use on all skin types, but it’s the dry and mature skin that benefit the most from it thanks to the hydrating and anti-aging abilities. Hyaluronic acid is also a good choice for the oily and combination skin that need hydration as its formula is lightweight and doesn’t weigh down the skin. The sensitive and blemish-prone skin may also profit from the hyaluronic acid that calms and protects the skin due to its antioxidant proprieties. 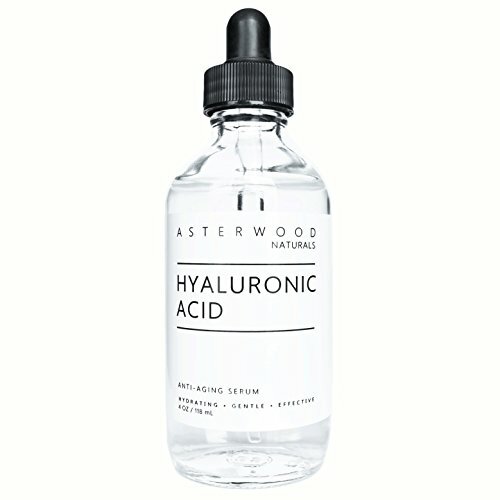 What’s the best way to use hyaluronic acid? It’s a common thing to start slow with any new skin care ingredient and the hyaluronic acid falls in the same category. It’s better to apply it only once a day in the beginning so that your skin has time to adjust to it. If everything goes well, you may apply it also at night, before the heavy oils and creams. 1. 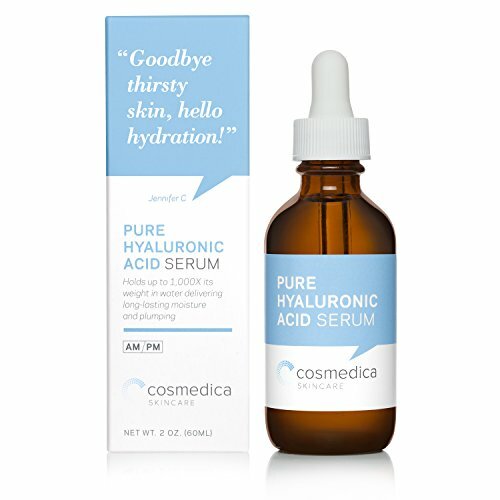 Going shopping on a tight budget is no picnic, but you can still get a good deal with a serum like the Best-Selling Hyaluronic Acid Serum for Skin by Cosmedica SkinCare. The serum doesn’t impress only with its price (which seals the deal for many), but also with its quality and performance, considering the buck you’re paying. The serum is made with natural and organic hyaluronic acid and brightens the skin. It also improves the texture of skin, ensuring good moisture and balance in skin. It hydrates the skin as it’s made with 100% pure hyaluronic acid. The serum is also a good option for fighting aging of skin as it fills in and reduces the fine lines and wrinkles. It leaves the skin softer, plumper and smoother, which only a young skin typically is. Able to eliminate dryness from the skin as it’s highly hydrating, the serum lightens the dark under eye circles and is a dependable option for under eye puffiness treatment. The formula is both effective and gentle so the serum addresses all skin types, oily and sensitive skin including. The serum fades out the sun spots and age spots, while reducing the pores of skin. The gel consistency of the serum soaks right into the skin and the serum is easy to spread too. You can use it twice a day, on a clean skin. It’s better to use upward circular motions, in a gentle way. It’s wise to follow it with a good moisturizer. Even though it has a specific scent, it’s important to mention the smell doesn’t linger for long on skin. As long as you’re focusing on the goods, which surpass the negatives, you should take the leap of faith with the serum, especially since you’re not spending much money anyway. 2. 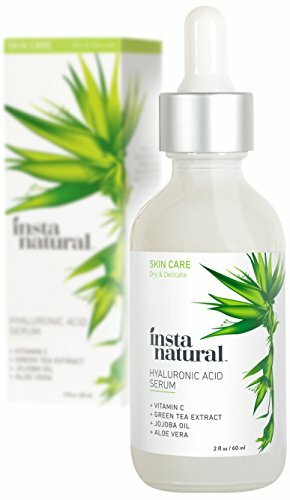 Instantly soothing the dry skin on face and body, the InstaNatural Hyaluronic Acid Serum is going to satisfy most customers out there. The serum is a great option for hydrating spot treatment and alleviates the driest patches of skin. It firms the skin and makes it look younger again. The formula stands out with an incredible mineral infusion, so the serum sure offers nutritional facial boost. It diminishes the appearance of dark circles and eliminates dryness from skin as it also contains vitamin C and E.
As a matter of fact, reading the list of ingredients is going to take you a lot more than a few seconds. Here’s what you’re going to find on it: Aloe leaf juice, licorice root extract, jojoba seed oil, meadow foam seed oil, rosemary leaf extract, hibiscus flower extract, ginkgo biloba leaf extract, punica graantum fruit extract and tea tree. As it’s natural and organic, the serum works for all skin types and brings comfort to the sensitive skin. It regulates the oil in an oily skin and helps makeup glide smoother. The serum sinks into your skin and leaves a fresh and soft feel to skin. It tightens the skin and hydrates the skin. Repairing the damaged skin, the serum smooths out discoloration and evens out your skin tone. It also makes the dark circles and puffiness around eyes less noticeable and brightens blemishes. The serum doesn’t cause breakouts, irritations or allergies and it’s made in our USA. For the natural formula and ability to improve the health and appearance of skin, the serum is a definite “go” for most. 3.The competitive value and attractive price of the Radha Beauty Serum for Youthful Skin and Face are its main strengths, but the serum sure does bring a lot more to the table. The moisturizing serum is a strong moisture-binding concentrated option that increases the suppleness and hydration of skin. As you may know by now, hyaluronic acid is naturally found in our body and has the amazing ability to seal in high levels of moisture in skin. This is why the serum hydrates the skin for a long time, with only but an invisible layer of moisture. As hyaluronic acid attracts up to 1000 times its weight in water from the moisture in air, the serum controls moisture in skin and repairs the damaged skin. It gives your skin back its youth and glow, smoothing out the fine lines and improving skin’s ability to hold in moisture. Many of the ingredients listed on the formula are already known for their benefits for skin. Aloe, vitamin C, botanical hyaluronic acid, green tea, witch hazel, ferulic acid, and jojoba oil are some of the names that explain the serum’s efficiency. The serum works for the sensitive and oily skin and its lightweight texture soaks right into the skin. A little goes a long way so the serum is going to hold up for quite some time. Eliminating redness and lessening the visibility of fine lines and wrinkles, the serum tightens skin and removes dullness from skin. It doesn’t cause breakouts and leaves a fresh feel on skin. Even though it has a specific smell, we need to mention it doesn’t stay for long on skin. It comes with a dropper so the use shouldn’t be tricky at all. Reliable, fairly priced and great for a younger skin, the serum isn’t to be skipped on next time you’re shopping. 4.Not all hyaluronic acid serums have to have a sophisticated formula in order to be effective. 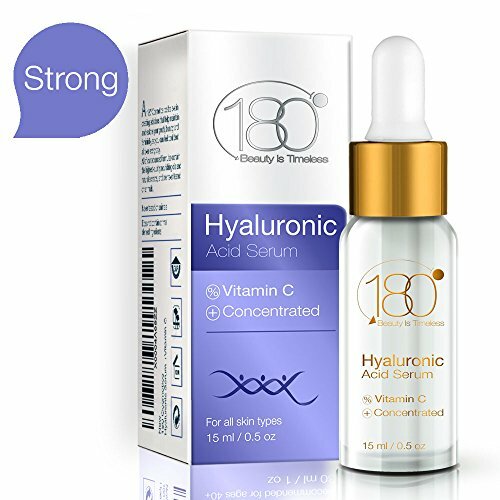 It’s the case of the Face Serum – Hyaluronic Acid Serum with Peptides & Vitamin C from 180 Cosmetics that manages to increase the well-being of your skin, with just a few ingredients. The serum is a good quality peptide wrinkle serum that addresses the mature skin. It boosts your skin’s elasticity, for a younger appearance. It also hydrates the skin in the most effective way. The formula also includes Vitamin C so it diminishes the visibility of fine lines and wrinkles. It removes the dead skin cells, only to allow new and younger looking skin to surface. The skin gets softer and smoother and healthier looking. The serum sits rather on the thicker side, but it spreads and penetrates the skin rather fast and easy. It plumps the skin and tones it too. The serum shrinks the size of pores, which translates into better skin texture and appearance. Due to its formula, the serum doesn’t cause irritation so it’s a safe option for the sensitive skin too. It feels amazing on skin and you should wait a month or so until you see the improvements in skin. You only need to apply a thin layer on your clean skin and follow the serum with a moisturizer. Use circular motions and massage it slowly into your skin. The makeup is going to layer just fine afterwards. You can confidently include it in your morning and night time skin care routine. However, as it’s dependable and able to improve your skin’s texture and complexion, the serum isn’t far from being the perfect choice for many. 5.The Pure Hyaluronic Acid Serum 2 Ounces by Eve Hansen replenishes and gives your skin back its firmness and elasticity thanks to the hyaluronic acid within the formula. The serum is able to lower inflammation, but also to sustain collagen production and to keep the free radicals away from the skin. The hyaluronic acid serum hydrates and moisturizes the damaged skin, leaving a healthy radiance to it. It smooths out the skin and lessens the visibility of fine lines and wrinkles, for a younger look. The power of the serum doesn’t stop here and the serum is also able to diminish the appearance of dark circles and puffiness under the eyes. It fades out blemishes and redness and sooths the dry and irritated skin. Going over the list of ingredients is going to take you a while as it’s rather long and here’s what you’re going to find on it: organic aloe, witch hazel, wild crafted green tea, geranium essential oil, botanical hyaluronic acid (5%), vitamin C and Vitamin E.
The serum isn’t sticky and gives best results when used both at night and in the morning. 3 to 5 drops are going to be enough for gently massaging the face, neck and other desired areas. You should follow it with a moisturizer. Long lasting, the serum goes great under makeup and doesn’t clump up. Its formula doesn’t include alcohol, paraben, fragrance and it’s 100% vegan. Try to only see the goods as the bads aren’t that bad at all. Improving your skin’s texture and hydrating it too, the serum is worth to try when in need. 6.Asterwood Naturals gives us a 100% pure vegan Hyaluronic Acid Serum 4 oz – 100% Pure Organic HA that not only hydrates the skin, but also plumps the skin, filling in the fine lines. The serum is made with 100% pure vegan hyaluronic acid and manages to reduce the looks of wrinkles and fine lines, for a smoother and younger look of the skin. It also increases the elasticity of skin, typically a sign of aging of skin. The benefits of the hyaluronic acid serum are the typical ones, only at a higher level. It does improve your skin’s texture as it minimizes the pores. It also fades out sun spots and age spots, some of the early signs of skin aging. It penetrates deeply the skin for a deep moisturizing and hydration of skin. This is why the serum also eliminates dullness from skin, leaving a more radiant skin instead. Able to improve your skin complexion, the serum brightens skin and makes blemishes less noticeable. It works great for the tough and dry skin and it’s safe option for the sensitive skin too. Easy to use, the serum doesn’t contain any oils, fragrances or parabens. Just to be sure, it’s wiser to run a patch test before starting the regular use. It’s great to use right under makeup and its consistency blends just fine with other skin care products. We also need to mention the serum has never been tested on animals. For the simple, yet effective formula and reliability, the serum is worth to try and money well spent any given day. 7. 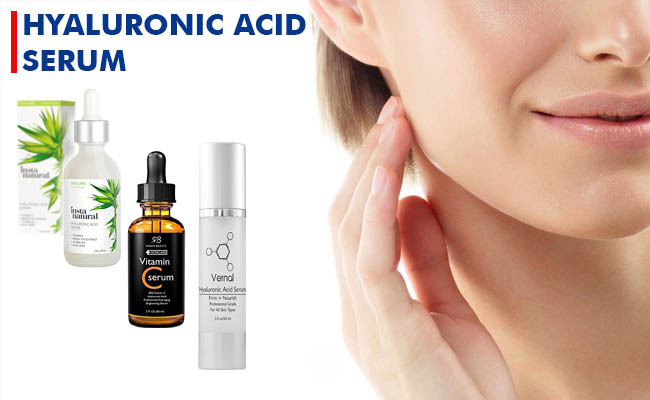 Helping your skin to keep on producing the natural collagen, the Vernal Skincare – Best Hyaluronic Acid Serum With Vitamin Vitamin C, A, D & E should be on your list when you’re determined to take your skin care routine to the next level. The serum is also able to increase your skin’s elasticity and resilience, thus making the fine lines less visible. The anti-aging serum is formulated with Vernals, which is a customized combo of Pure hyaluronic acid that fights against aging of skin. The serum presents an anti-pollution powder that keep the outer pollutants away from your skin. The Skingencell 1P slows down the aging effects of Serpin B3 that cause the aging of skin, whereas the botanical ingredients moisturize, hydrate, plump and smooth out the skin. The list of ingredients also includes aloe Vera, witch hazel extract, retinol and vitamin E.
The serum makes the wrinkles less visible and the sagging or large pores slowly disappear. The skin becomes clearer, more resilient and glowing. The serum addresses all skin types and restore the youth of skin in a delicate way. It also minimizes inflammation and brings comfort in eczema, dry and irritated skin. It makes skin less dull and reduces the coarse wrinkles. Due to its formula, the serum also strengthens the skin and works even for the most sensitive skin. It doesn’t clog pores and has no parabens or sulfates. The minty smell dissipates rather fast and the serum dries in 30 seconds or so. It absorbs fast into the skin and some get results even without daily use. Regardless of the minor problems, the serum still is an impressive option for most and you should give it a go. 8. If you’ve searched high and low for a hyaluronic acid serum that improves your skin’s texture and a bit more, your search is now over. 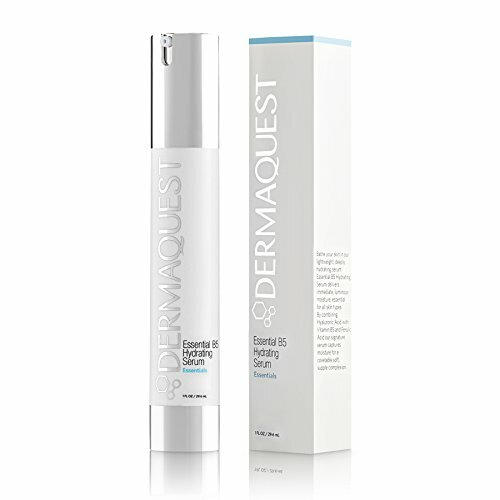 Put your money at stake with the DermaQuest Essential B5 Hydrating Serum with 40% Hyaluronic Acid & Ferulic Acid that hydrates the skin, healing the damaged skin altogether. The serum also balances your skin’s natural lipid layers and attracts moisture, only to protect your skin’s complexion on a cellular level. The formula includes hyaluronic acid (40%), vitamin B5 (which rejuvenates the skin), but also antioxidant ferulic acid that protects the skin against the outer stressors. It also contains an MDI Complex that increases your skin’s firmness and elasticity. The plants stem cell technology involves extracts of cucumber, plankton, mallow flower and helix ivy leaf- all known for their anti-aging abilities. The serum is safe for all skin types, acne-prone including. It has benefits for the aging, drying, sensitive and normal to combination skin. It sooths the skin in rosacea and eliminates redness. It’s a great option for addressing breakouts and flare-ups. Lightweight and ultra-active, the serum penetrates fast and easy the skin. Its effects last all day long and the serum is a year round must have. It’s not greasy and leaves no residue whatsoever, but only smoother and clearer skin. Apply the serum on cleansed skin, delicately massaging it into your skin. Finishing on a positive note, we stand by the serum as it’s made with high quality ingredients and keeps your skin hydrated and younger, for quite some time. 9. The more you’re willing to pay for your hyaluronic, the more you can expect when it comes to the quality of the ingredients and overall performance. Therefore, even though you may be feeling like paying the extra buck for the PCA SKIN Hyaluronic Acid Boosting Serum, it’s only a matter of time until you realize the serum is well worth it. The serum stands out with an advanced hyaluronic acid formulation so it penetrates deeply your skin for a long-lasting hydration. The serum hydrates the skin on three levels: on the surface, deeper in your skin and by improving skin’s own hyaluronic acid production. The hyaluronic acid is able to gather and seal 1,000 times its weight in water on the surface of skin, ensuring immediate hydration and smoothing. The HA-PRO complex boosts the skin’s own hyaluronic acid for a 24 hour lasting hydration. The hydrolyzed hyaluronic acid within the formula goes deeply into your skin and seals in moisture of the skin, plumping the fine lines below the skin surface. As for the ceramides from the serum, they are great for sustaining the renewal of the skin’s natural protective layer, creating an efficient barrier that maintains moisture. The list of ingredients also includes rosemary leaf oil, niacin amide, hydrolyzed yeast extract and jojobas esters. The formula doesn’t include any synthetic dyes, fragrances and only safe ingredients. It works for all skin types and has never been tested on animals. The serum feels nice on skin and leaves the skin smoother and softer. As long as you’re not worried about the money you’re paying for the health and youth of your skin, the serum should remain a valid choice for many. 10. If price tag is last you check when shopping, you shouldn’t sit on a fence when running into the Airelle Skincare Anti-Aging Facial Serum with Hyaluronic Acid. Not only the serum is good for all skin types, but it also makes the wrinkles, fine lines and crow’s feet less noticeable. It rejuvenates the damaged skin and improves the looks of skin too. The formula is based on high medical grade natural ingredients like aloe Vera, Irish moss extract, witch hazel, linseed seed extract, Manuka honey extract, clove bud oil and peppermint leaf oil. Vitamin C and Vitamin E are also among the ingredients. The main ingredient of the serum is Berrimatrix, a strong blend of blueberry extract. Berrimatrix is a new ingredient and it’s scientifically proven to sustains photo aging. Berrimatrix reverses the signs of aging and minimizes the risk for future developing of wrinkles. The serum comes with a medicine dropper so it’s rather easy to get the right amount every time. It’s lightweight and soaks right into the skin. Its non-sticky formula lessens the visibility of sun damage and aging signs, whereas aloe calms and nourishes all skin types. It’s important to shake it gently before applying. You can use it daily, both in the morning and at night, on face and neck. Smelling amazing, the serum helps the makeup not only glide easier, but also last longer. Made with all natural ingredients in our USA, the serum has never been tested on animals and its packaging is made of recyclable materials. As long as you’re not worried about your wallet, the serum is a great investment to make for the well-being of your skin. 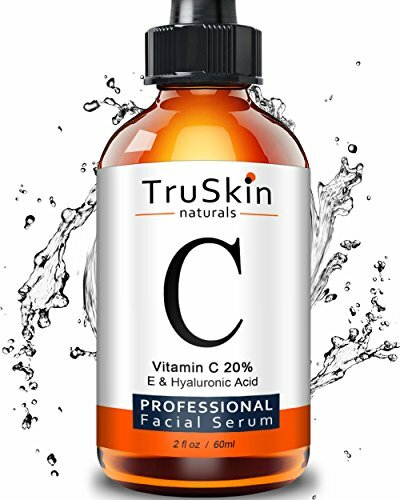 If you’re not only looking for a hyaluronic acid serum, but for one that is also containing Vitamin C, a sure buy for you would be TruSkin Naturals Vitamin C Serum for Face, Topical Facial Serum with Hyaluronic Acid & Vitamin. The serum is a true winner as it doesn’t contain just the two ingredients, but also so many other ingredients that are already known for their powers on skin. Designed to minimize the appearance of sun spots, blemishes and irritations, the serum is going to work also in eczema and psoriasis. It firms the skin and gives it a healthy glow. On the list of ingredients, you’re going to notice Vitamin C, hyaluronic acid, jojoba oil, organic Gotu Kola, geranium, dandelion and witch hazel. This is why the serum slows down efficiently the aging of skin, smoothing out acne scars or stretch marks. All of the ingredients within the formula works for your skin to remain healthy and become younger looking once again. The formula is safe to use on all skin types as it’s based on plants that don’t contain stabilizers. The serum’s formula doesn’t contain any fragrances or synthetic color additives either. However, you should stay on the safe side and run a patch test. Leave it for 24 hours and check out the skin for any side reactions. You only need 3-5 drops of the serum for each use. Most use the serum AM and PM and apply a moisturizer afterwards. The serum soaks right into the skin and it doesn’t weigh down your skin since it’s lightweight. Needless to say, the serum is formulated and bottled in USA and has never been tested on animals. All in all, the serum slows down the aging of skin and is a good investment to make for the health and youth of your skin. 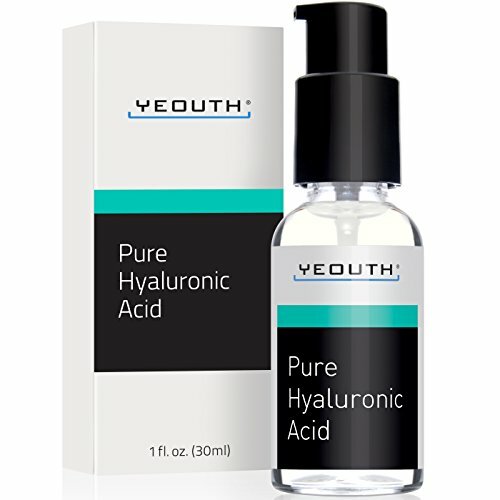 The 100% Pure Medical Quality Clinical Strength formula of the Hyaluronic Acid Serum for Face by YEOUTH should be enough reason for you to give it a go when in need. The serum is strong enough to hold 1,000 times its own weight in water so it manages to plump and hydrate the skin. Just because it’s strong, doesn’t mean it’s not gentle and the serum addresses all skin types, even the sensitive skin around the eyes. It’s an anti-wrinkle serum that doesn’t cause redness or irritation. It’s lightweight and soaks right into the skin, without leaving any greasy residue. You really get a multi-tasking product that is loaded with pure hyaluronic acid, the strong humectant that repairs, calms and tones the skin, holding in moisture for longer time hydration. The serum leaves the skin healthy, younger and glowing. It offers moisture for all day long, improving performance of the other skin care products. The serum increases the elasticity and firmness in skin, leaving it softer and suppler. Hyaluronic acid is great for the oily skin and its lightweight consistency moisturizes efficiently the skin. It’s gentle for the sensitive skin too. Let’s not forget to mention that hyaluronic acid also offers antioxidant protection against the outer stressors. You may use the serum both AM and PM, on a cleansed skin. Apply only a pea-sized amount of the serum on the whole neck and face, letting it to absorb into skin. Once it’s fully absorbed, follow it with a facial moisturizer. The serum tightens skin, dries fast and has no obvious scent. As the list of good things surpasses the minor issues, we see no obvious reasons for you not to try it when in need. 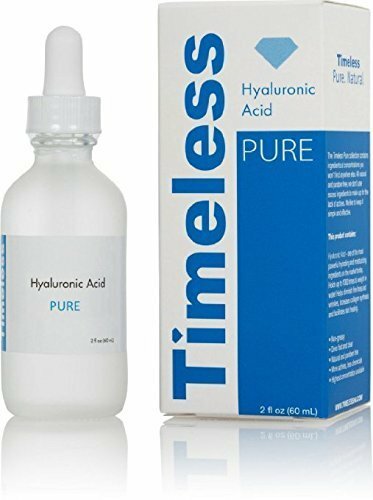 If you’re only looking for the pure hyaluronic acid serum, look no further and give it a go with The Original Hyaluronic Acid Serum 100% Pure by Timeless. Formulated with 100% pure hyaluronic acid, the serum doesn’t impress with a long list of ingredients, but with its performances on skin. The serum is 100% natural and 100% vegetarian and doesn’t irritate the skin, becoming a safe choice for all skin types. Lightweight, the serum is easily absorbed into your skin and leaves no residue whatsoever behind. It tightens the skin and diminishes the appearance of sags and wrinkles. It’s also able to lighten up the dark circles, improving the skin complexion. The serum also shrinks the pores and hydrates the skin for all day long. It may give a tingly sensation in the beginning, but you should give your skin time to adjust to the serum. After your skin is cleansed and dry, apply only a little bit of the serum on face, neck and décolleté. The serum dries rather fast, but some like to let it soak for 15 minutes or so. Always follow it with a good moisturizer. The serum goes great under makeup too. It’s an odorless clear light gel serum that combines pretty well with other skin care products. The serum leaves the skin firmer and hydrated, with a healthy glow. It’s made in our USA and comes for a very good price. All things considered, as it’s pure and effective, the serum is a valid option and a great value for the price. 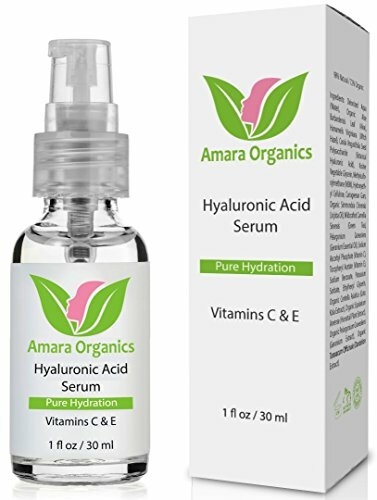 The dramatic changes to skin that many experienced while using Amara Organics Hyaluronic Acid Serum for Skin with Vitamin C & E should make you curious enough to try it next time you’re shopping. Not only the serum is formulated on hyaluronic acid, but also on many other ingredients that are well-known for their powers on skin. This is why the serum leaves the skin silky and smoother. Able to seal in up to 1,000 times its weight in water, the serum attracts moisture out of the environment, creating a hydrating barrier that protects the skin. 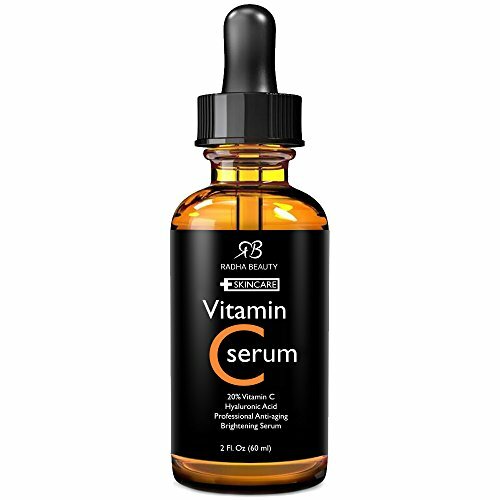 The serum is also infused with strong antioxidants like vitamin C and E, minimizing the damage of free radicals on skin. It slows down the aging of skin and fills in the fine lines and wrinkles. The serum increases elasticity of skin and evens out the skin tone, for a healthier glow. The formula includes several other natural and organic ingredients: aloe Vera, jojoba oil, horsetail plant extract, dandelion, geranium essence oil, vitamin C and E, and Gotu Kola extract. As it’s non-irritating, the serum is safe to use on all skin types. It doesn’t contain harsh chemicals, artificial colors, parabens, dyes or fragrances either. It works for the sensitive and dry skin too. You may include the serum in your morning and night time skin care routine. Apply only a bit of it on the desired cleansed and dry area. The serum is easily absorbed and helps the makeup go smoother afterwards. Made in our USA, the serum is also vegan and cruelty-free. All things considered, as it’s made with natural and organic ingredients, the serum is a nice addition for anyone’s proper skin care routine.